I have just looked at this question, and the comment about the possible duplicate is hidden due to the number of comments. It is not even the case that the other comments have many up-votes. More thoughts.... base on very usefull feedback. What I think is needed, is that a new “possible duplicate of” comment is visible until other comments get a reasonable number of up votes AFTER the "vote to close" is cast. So maybe just give the “possible duplicate of” comment n+2 votes when it is created, when n is the number of votes the most up-voted comment has at present. I really like this idea, and reading through the comments I think a lot of these things can be put together. Dan Barron suggests we "pin" (so to speak) these comments to the top of the list, which would be helpful. Kendra pointed out that this might not work if the user manually types a dupe comment, and TLama mentioned that there may not be a special flag, but just noticeable text. Would it be an appropriate suggestion to have all comments of the form "possible duplicate of: [SO link]" pinned to the top of the comment list? This way we are able to accommodate both the auto generated comments and comments typed manually. 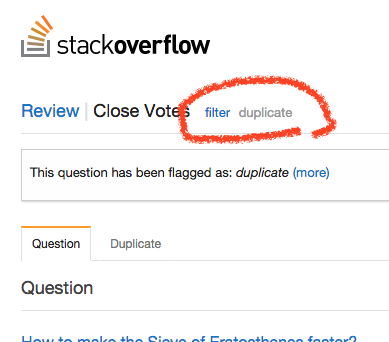 The difficult part here would be verifying that a valid StackOverflow question was linked. Do you think this matches what you'd like to do? Playing devil's advocate, though, this allows any user to type that comment and have their comment pinned, and this ability can be abused. As an alternative, could we have all "possible duplicate of: " comments automatically generate a duplicate flag by that user? This way user's can't just run around and type comments like that, and maybe a check can be done to reject those comments if the user's have raised enough flags already. You've not explained why "possible duplicate" comments are any more important than other kinds of comments. Why is a comment asking for clarification or providing additional context (that may render the "duplicate" link inaccurate) less important? The value in the comment being auto-generated is to give the author a chance to respond, perhaps explaining why the "possible" duplicate is not, in fact, a duplicate. this question is not a duplicate of the first question you list which is specific for abstract classes and I reference the second one in my question, I don't think this is a duplicate is that the question is strongly biased towards having vritual dtors an I wanted a n open discussion. How do I find duplicate entries in a database table? Read it more closely. This is not a duplicate. Not a duplicate at all. He wants to find the duplicate rows (and more that that), not to remove them. Python - why use "self" in a class? no, it is not a duplicate. Huh? The other question is asking why we need to explicitly pass self. This one is asking about the difference because class and instance variables. That isn't the same question. I even looked at that one before asking it. 68282 is a useless question about why you have to explicitly put self as the first argument to methods; this question asks about the difference between class and instance members. This really gets us back to the whole discussion about whether or not questions should display "This question may already have an answer" banners. The general consensus, as I've understood it, has been that these kinds of banners (or pinned comments, which amount to the same thing) provide too much room for abuse and give too much "power" to a single user. Question X becomes hot due to Reddit or the Multicollider. Bob sees question X but wants attention for his (unrelated) question Y. Bob casts dupe close-vote on X with destination Y. Much of the traffic pouring into X is now redirected to (unrelated) question Y. Tons of nasty comments from confused users over why the banner is there for an unrelated question Y. Yes, this type of abuse would warrant severe moderator consequences. But unlike vandalism edits, this banner cannot be removed (by normal users). So you're allowing a single user to do so much damage that cannot be reversed without a moderator. Why does the comment need additional visibility? We looked at implementing this, hoping it would be a simple change that would offer some benefit. But, apparently it is not simple. Changes to comment rendering rarely are. Which leaves the potential benefits... This would only affect posts that have numerous - more than 5 - comments, and only really matter to people who can vote to close them. Hard to guess at the latter, but the former I can calculate: at best, this would affect roughly 22% of page views where these comments are present. That's assuming these comments are always hidden: if they're upvoted, they may not be, if they were posted early, they may not be. That's still plenty of evidence of a problem to be solved, but perhaps not solved in this manner. If this was easy to implement, it'd be worth doing just for the fraction of cases where it'd help, but... It is not. This is yet another reminder of the rough edges present for both long comment threads and duplicates: the logic used for picking comments in the former is naive, the design for exposing the latter to those that would benefit from it a hodgepodge of ideas from different eras and reflecting different philosophies. Both could use a serious overhaul. My attempts to flag incorrect "possible duplicate" comments have always been declined; as far as I can tell, the mods are extremely reluctant to clean these up. And things get incorrectly labelled as duplicates reasonably frequently. The last thing we need is to privilege such noisy, harmful comments such that they will always be visible and push other comments that may have actual value out of the way. If a "possible duplicate" comment has value and you want it to be visible, upvote it. There's no reason it shouldn't have to compete for visibility like any other comment. Not the answer you're looking for? Browse other questions tagged feature-request status-declined comments duplicate-questions .